Officer Justin DiGiacamo of the Pine Hill Police Department shows PhillyVoice how to prepare and administer naloxone (Narcan). Gov. Tom Wolf’s administration will be giving out free naloxone, the anti-overdose drug often used to reverse opioid overdoses, at 80 locations across the state on Dec. 13. No appointments will be necessary at the locations. In April, U.S. Surgeon General Dr. Jerome Adams issued a public health advisory encouraging residents to obtain and carry naloxone in the face of the country’s current opioid crisis. But a Narcan kit, the brand name of the opioid antidote, often starts around $130 for two 4mg nasal sprays if your insurance doesn’t cover it. Thus, the state made the decision to give it away for free next week to those actively seeking to carry naloxone. 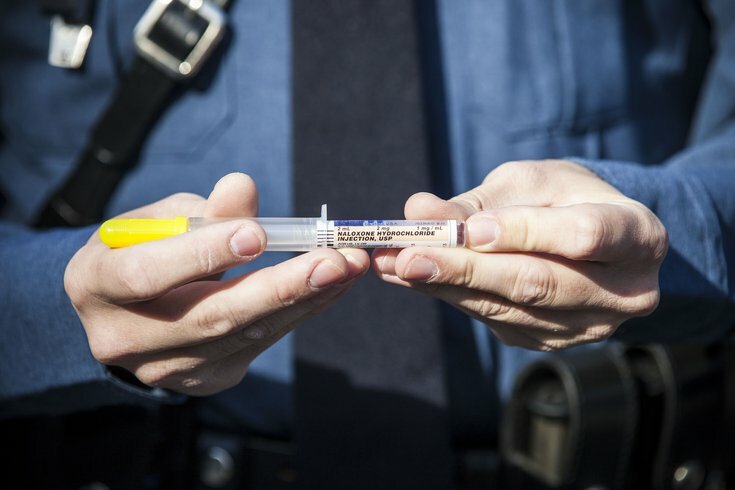 According to the state, more than 20,000 people have been revived with naloxone by police officers and EMS providers across Pennsylvania in the last four years. Below is a list of the giveaway locations in the area. Naloxone will be distributed between 11 a.m. and 7 p.m. at the locations, unless otherwise noted.